We can't transform our exploitative agricultural system through consumer choice. We need a collective movement. Kim Severson at the New York Times recently noted that a fundamental necessity of life — food — has been little discussed this election season. With the notable exception of the Greens, no party’s platform mentions the ecological and economic costs of industrial agriculture. This is, obviously, a mistake. Article 25 of the Universal Declaration of Human Rights, which declares food a human right, is far from being realized, and the dominant agricultural model has concentrated private control over the production and distribution of food globally, harming peasants, farmworkers, and the environment. In the United States, nearly two-thirds of total food sales come from a cluster of mega-farms. These large, heavily subsidized farms — which constitute less than 4 percent of farms nationwide — rely on chemically intensive methods to grow food. Agricultural concentration began half a century ago. Family farms decreased precipitously from 1950 to 2002, while the number of farm laborers fell from ten to three million. Today small operations still make up 90 percent of farms in the United States, but they account for only 26 percent of production and have little impact on overall food production and distribution. This concentration is intensifying. Between 2007 and 2012, only mega-farms — those making above $500,000 annually or holding more than two thousand acres — increased in number. Neither technological advances nor broader economic shifts produced this dramatic shift. Instead, public policy has been oriented toward subsidizing and expanding the industrial agriculture model. From 1995 to 2014, the top 10 percent of government farm subsidy recipients received 77 percent of total state subsidies, reaching over $141 billion. In the same period, 62 percent of American farms received no subsidies. Industrial agriculture advocates justify these skewed rewards by pointing to increased yields and decreased prices. They claim that concentration, mechanization, synthetic inputs, and reduced labor costs have produced a more efficient system. Without industrial agriculture, the argument goes, we would be unable to meet the nutritional needs of a growing, global population. This argument does have some merit. Over the past thirty years, higher yields and lower prices have accompanied a decline in global undernourishment — defined as a state of not meeting caloric dietary requirements for at least a year — from roughly one in five people to one in ten. Of course this improvement remains geographically uneven; for example, even in a wealthy country like the United States, undernourishment still affects roughly one in seven people. To be sure, we can’t blame industrial agriculture for all our planet’s ecological ills, but it plays a crucial role. For instance, the clearing of forests, grasslands, and wetlands in places like the Brazilian Amazon for crop production has massively reduced biodiversity. At the same time, an increasing number of scientists consider monocropping — the dominant mode of industrial agriculture — ecologically dangerous. It destroys the soil’s nutrient diversity and makes yields more susceptible to crop failure through disease and pests. Modern agriculture’s heavy dependence on fossil fuels — in machinery, transportation, and even the material make-up of some pesticides and fertilizers — compounds these problems. Synthetic inputs create “rifts” in natural earth processes that continually deepen as producers rely on more and more chemical interventions to sustain profits. Between 2007 and 2012, the purchase of chemicals for agricultural production increased over 60 percent. These pesticides, herbicides, and fertilizers end up in water systems and coastal zones. For example, an area in the Gulf of Mexico — as big as Connecticut and Rhode Island put together — has such low oxygen levels that marine life is now unviable. Nitrogen runoff from industrial agriculture in the Mississippi watershed directly produced this dead zone. Activists and scientists have long understood the dangers of industrial agriculture, and the organic movement dates back to the early twentieth century. 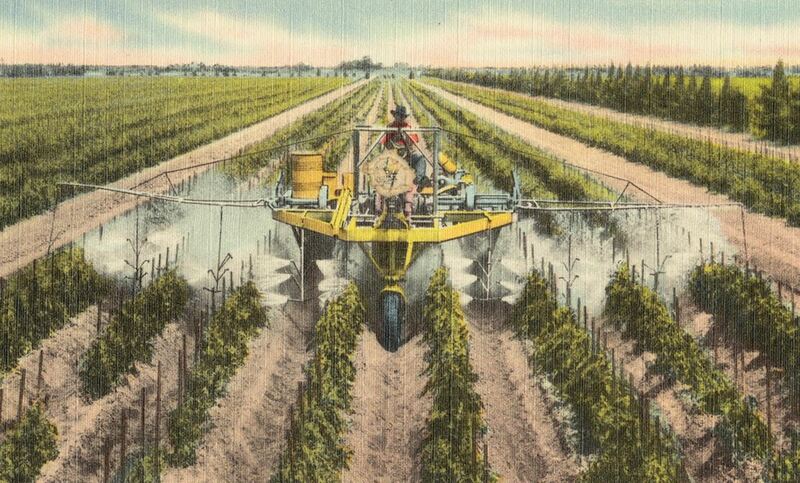 Practitioners, like Jerome Irving Rodale, publisher of Organic Farming and Gardening in the 1940s, shared an “aversion to the use of synthetic fertilizers.” Early industrial agriculture’s failures — declining yields in the 1930s and the Dust Bowl’s link to topsoil depletion — made the mid-century valorization of “natural” more popular. Today, many food sovereignty movements take their cues from agroecology. This farming method systematizes local, organic farming and applies ecological principles — like integrated farming, biological inputs, and the appropriation of already existing land use, flora, and fauna — to increase yields. The most common argument against organic farming is that its yields fall substantially short of conventional practices. For example, a 2012 study in Nature stated that industrial agriculture had yields (depending on conditions) 25 percent greater than organic farms. But recent research puts the difference at less than 20 percent. Further, multicropping and crop rotation could narrow the gap even further, to just 8 or 9 percent. For instance, agroecological production of corn, wheat, and rice yields “one to three calories of food energy per calorie of [human and human-produced] energy” expended. Industrial agriculture, by comparison, requires up to ten or fifteen calories of energy input per calorie produced. The more ecologically disruptive the production model — for example, on single-crop farms — the higher the input requirements. This explains why industrial agriculture contributes between 22 and 33 percent of greenhouse gas emissions. Growing evidence suggests that agroecology has the capacity to supplant industrial agriculture. So, why hasn’t it made much headway? Agribusiness and state governments efforts to block the spread of agroecological practices are a major factor. But the movement itself, and what it believes it is trying to accomplish, is also a major roadblock. The discourse surrounding “local food” has dampened its wide acceptance. So far, its advocates prefer to moralize consumption and production and ignore the structures that underpin capitalist agriculture more broadly. Food is different. You can simply stop participating in a system that abuses animals or poisons the water or squanders jet fuel flying asparagus around the world. You can vote with your fork, in other words, and you can do it three times a day. Contra Pollan and company, exploitation — not choice — controls food production. Capitalist agriculture thrives in large part because it appropriates so much surplus value from farmworkers. In 2013, each of the more than one million US farmworkers produced almost $70,000 in value, yet received less than $30,000 in wages. The abandonment of agricultural workers solidified Dixiecrat support for Wagner’s proposal, while dividing agricultural workers from the industrial labor movement and denying them the protections their urban counterparts had won. Because of this exclusion, working conditions have improved little since 1960 when Edward R. Murrow made Harvest of Shame. Child labor, crumbling housing, wage theft, unsanitary conditions, sexual assault, and lack of medical care still pervade the industry. Today, predominantly Latino workers arrive either on H2-A visas — which link them directly to their employer — or as undocumented laborers — which puts them under constant threat as farm owners hang immigration laws over their heads. These conditions have been called “The New American Slavery.” Repressive tactics — like when North Carolina state senator Brent Jackson and his son, Rodney Jackson, blacklisted seven workers for pursuing legal claims against their farm — run rampant. These horrible conditions continue because agricultural profits depend on racist exploitation and outright repression. Meanwhile, transnational distributors, like Walmart, push growers to reduce costs and expand production through the purchase of monopolized inputs, like GMO seeds and pesticides. Farmworkers have long fought for better wages and working conditions. In recent years, the Coalition of Immokalee Workers (CIW), a farmworker organization from South Florida, has convinced distributors to pressure farmers to allow their employees to organize for education, increased wages, and access to sanitary bathrooms and water. Agricultural concentration makes CIW’s strategic attacks on supply chain nodes more effective. Just six transnational companies control more than 80 percent of wheat’s global value chain. Similarly, certain products — like the tomatoes CIW members pick — are grown in small geographical areas. More importantly, organizations like CIW and the Farm Labor Organizing Committee (FLOC) — an AFL-CIO affiliated farmworker union active in North Carolina and Ohio — have successfully fought for the implementation of basic safety regulations. For instance, farmworkers are routinely sprayed by pesticides and herbicides, without warning, protective equipment, or education about its effects. They bring these harmful chemicals home on their clothing, negatively impacting not only the workers, but also their children. Unfortunately, they face an uphill battle: according to the United Farm Workers (UFW), an appropriations bill currently in the House of Representatives seeks to weaken EPA regulations on pesticides, which would further worsen conditions. CIW’s and FLOC’s organizing strategies have produced solid gains for their activists and communities, but their work has focused largely on developing contracts with employers and suppliers. We must move toward a more integrated political project that challenges capitalism. That can only occur when local food and farmworker movements unite to demand a fundamental change in the agriculture system, recognizing ecological and developmental concerns as essential to class struggle. When local, sustainable food becomes an ecosocialist project united with farmworkers in the struggle against exploitation, agroecology’s liberatory potential can be realized. To achieve this, we must emphasize the interlocking interests of both movements, especially with regard to the revitalization of the commons. Organizations in the Global South have already undertaken this project. La Via Campesina — one of the largest peasant groups in the world — reflects these principles in its political agenda. The Declaration of Niéléni, which came out of the 2007 Forum for Food Sovereignty in Sélingué, Mali, demands peasant control of agriculture and a decolonization of the capitalist food system through massive land redistribution and the democratization of political institutions. La Via Campesina has its flaws, but it demonstrates how ecological and class interests can be integrated into political struggle. Capitalist industrial agriculture has helped push our planet past multiple boundaries, endangering the dignified existence of the species and increasing the risk of a civilization-level catastrophe. This original vision needs a rebirth. Otherwise, the choice-centered food movement will likely fuel new rounds of capitalist expansion and become another instance of faux rebellion converted into a liberal status symbol and a market niche. Food justice is class war. It’s time we accept that. Jason Allen is a writer and a master's student in sociology at North Carolina State University. We can’t transform our exploitative agricultural system through consumer choice. We need a collective movement.